A spokesperson told BBC News that EMI had "not authorised content to be sold" on Bluebeat.com, which sells tracks for 25 cents (15p each). Last November, Sir Paul McCartney said he wanted The Beatles' catalogue to appear on Apple's iTunes store, but that negotiations had "stalled". Tracks on Bluebeat.com - which also features songs by other major artists including Robbie Williams and The Rolling Stones - are on sale for significantly less than other music download sites. 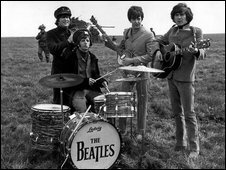 Bluebeat.com also streams songs - including those by The Beatles - enabling fans to listen to tracks for free. EMI want something we're not prepared to give 'em. It's between EMI and The Beatles I think - what else is new? Before that happens, EMI - which owns Beatles recordings - must agree a deal with Apple Corps, the company set up by the band to look after their catalogue. "We'd like to do it," Sir Paul told BBC News last November. "We are very for it, we've been pushing it. But there are a couple of sticking points, I understand." He added: "EMI want something we're not prepared to give 'em. "It's between EMI and The Beatles I think - what else is new?" EMI said at the time it had been "working hard to secure agreement with Apple Corps to make the Beatles' legendary recording catalogue available to fans in digital form". "Unfortunately, the various parties involved have been unable to reach agreement but we really hope everyone can make progress soon," a spokesperson said. There had been hopes that Beatles songs would become available after Apple Inc - which owns iTunes - ended a trademark dispute with Apple Corps in 2007. Discounting the audio files used in The Beatles: Rock Band video game, it will be the first time the Liverpool quartet's music has been sold as computer files.